Officially referred to by Mexicans as 'Acapulco de Juárez', this city is a truly world-class resort and amongst Mexico's most established and renowned tourist destinations. 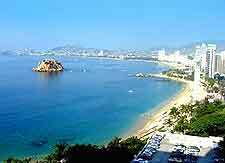 Acapulco is based around an arching, picture-postcard bay (Bahia de Acapulco), which is lined with luxury beachfront accommodation, air-conditioned shopping centres, and quality Mexican dining venues with multi-language menus. As well as its beautiful coastal scenery, the city also enjoys a stunning backdrop provided by the Sierra Madre del Sur Mountains. The resort of Acapulco is famous for its endless sunshine, glorious golden sandy beaches, enormous hotel complexes, exciting nightclubs, lively bars, and La Quebrada's daring cliff divers. For a touch of history, head to the Old Acapulco district (Acapulco Tradicional / Naútico), which lies on the western side of the city. 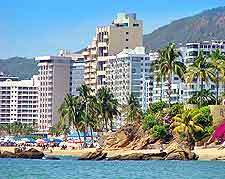 Other prominent districts include Acapulco Dorado - to the east of the Playa Hornos, and the Diamante district (Diamond Zone) - a modern, luxury resort on the southerly outskirts. Tourism and commerce have been major industries within Acapulco for literally hundreds of years. However, since the mid-20th century, tourism in Acapulco has really flourished, despite much Mexican competition. For tourist information in the city itself, head to the Centro the Convenciones (Convention Centre) on La Costera, where several tourist outlets can be found, such as the Casa Consular, Procuraduria del Turista and the official State Tourist Office. Many of the main tourist attractions in Acapulco are based around the coastline and include all kinds of water sports, such as water skiing, parasailing and riding on fun banana boats. Sportfishing is also popular and offers tourists the chance to catch some enormous marlin and even sharks. Others come to Acapulco for its scuba diving and snorkelling opportunities, with a number of spectacular coral reefs waiting to be explored, or for the opportunity to swim with dolphins at Delfines Paradise. For families in Acapulco, there is plenty of interest, such as Aca Zoo on the neighbouring Isla La Roqueta, the Magico Mundo Marino theme park and aquarium, the CiCi water park, and Parque Papagayo (Papagayo Park), where recreational activities abound. 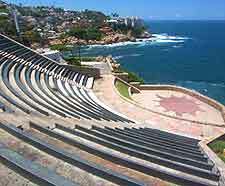 More information about Acapulco Tourist Attractions. Although Acapulco is a major beach resort, the city does contain a number of interesting sights and landmarks, including both historical and modern structures alike. The contemporary Chapel of Peace (Capilla de la Paz) boasts a stylish pyramid structure, while the striking, white Art Deco architecture of Acapulco Cathedral is equally impressive and quite unusual. Both the San Diego Fortress (Fuerte de San Diego) and the Fortin Alvarez offer an insight into the past military presence around the shoreline and also offer exceptional views. Sited in the very heart of Acapulco, El Zócalo, the main plaza, is of great local significance and regularly hosts many of the city's leading festivities. More information about Acapulco Landmarks. Around Acapulco, tourists will be able to visit a selection of insightful museums and quality art galleries. For information about the city's past, the Acapulco History Museum (Museo Historico de Acapulco) features many interesting displays and collections. Next to the Morelos area, the House of the Masks (Casa de las Mascaras) is home to many brightly coloured traditional Mexican masks. Those looking for Mexican art works should visit the Acapulco Arts Centre (Centro Cultural de Acapulco), Edith Matison's Art Gallery and Sergio Bustamante Gallery, where you will discover truly unique papier maché sculptures. More information about Acapulco Museums and Acapulco Art Galleries. The coastline stretches way beyond Acapulco and offers many further beaches. Less than 20 km / 12 miles to the south-east is the cove at Puerto Marqués, which offers calm waters, superb views of Acapulco Bay and beyond, and features a number of long sandy stretches, close to the Diamante district. Tourists venturing outside of Acapulco should also consider visiting the beaches along the Costa Chica, the university city of Chilpancingo and the historic city of Iguala. 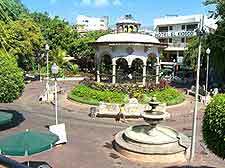 Also near to Acapulco are many quality tourist attractions within the state capital, Cuernavaca. 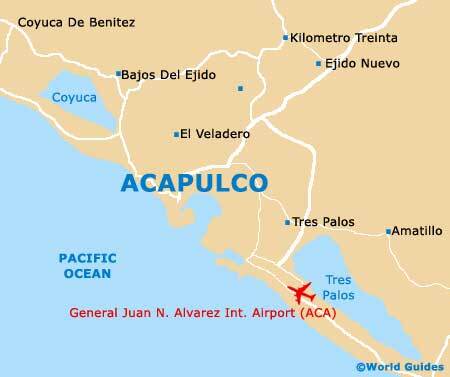 More information about Acapulco Attractions Nearby.